Video is now an essential corporate communications tool, whether it be for training purposes, marketing or entertainment. The potential uses for video in business continues to grow. Automatic Sync has developed corporate video captioning solutions for all types of video, including closed captioning formats for all delivery methods. Our automated process produces cost-effective closed captioning with fast turnaround times while maintaining high quality standards and accurate transcripts. Secure integrations with commonly used video platforms make our service effortlessly fit into your existing video workflow, and our personalized customer service will make the process even smoother. 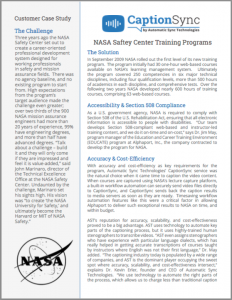 Below are just a few examples of the potential enterprise use cases for our captioning and transcription services. Adding closed captioning to training videos can make your company’s on-boarding process more effective and allows you to educate all employees, including those with hearing loss. Captioning can save time during the training process because it makes your video library searchable, and with interactive transcripts, trainees can easily jump to important parts of the video. All types of training videos can be enhanced by captioning, including legal, health and safely videos, employee orientation videos or video tours of your facility. Especially in larger companies, captioning is beneficial in all forms of corporate communication. Examples of captioned corporate video content are executive presentations, staff memos, staff meetings and other forms of internal communications. Because this content is captioned, your employees can easily find specific points in a video when they need to be referenced, saving time from searching through video libraries. Five percent of the world’s population has hearing loss, including an estimated 48 million in the U.S. alone. Not providing closed captioning for marketing videos means you could potentially be missing out on a significant part of your desired audience. Any kind of marketing video can benefit from closed captions, including branding videos, product tutorials, viral videos, event speakers, interviews, and recorded webinars. When an online video is captioned, it allows search engines to crawl the content, which is extremely valuable for search engine rankings. Captioning your video content also shows the deaf and hard of hearing community that your company is conscious of their needs and willing to provide the help they need, which can influence their purchasing decisions. If you think that the additional audience reach is too small for the investment, remember that even those without hearing loss will use and appreciate the captions. 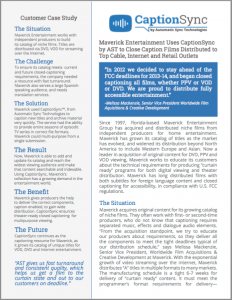 Maverick Entertainment uses AST to Closed Caption Films Distributed to Top Cable, Internet and Retail Outlets. 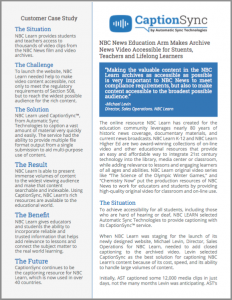 NBC News education makes archive news video accessible for students, teachers and lifelong learners.